Journalists used “fake” in the 19th century to warn American consumers about products proffered by patent medicine pushers, con artists. In 1989 newspapers started publishing made-up interviews and stories about invented battles. Fake News is not only in the political space but in other areas like manipulation of the stock market, health care options, business (Cadbury chocolate) and Bollywood too. 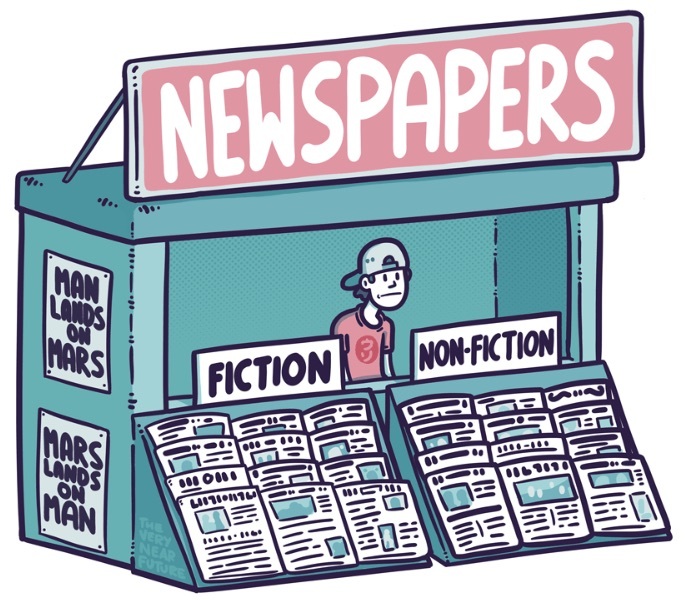 Local newspapers reproduce content published by big media houses and wire services. Readers of these newspapers never questioned the authenticity of what they read. But now the times have changed with social media thriving out there. What is a False Narrative? False narrative happens because they have insufficient information and an inaccurate assessment. a false narrative—a version of events that, while partly true, had been shaped, in this case by a newspaper report, to elicit strong negative emotions like anger, fear, or disgust. If you want your disinformation to convince people, it is always paid to base it on a germ of truth. False narratives linger in the public discourse for a long time horizon. Once in mind, you cannot change it. False narratives get solidified into commonly accepted truths due to the body of knowledge that gets built up over time cross-referencing material based on false narratives. False narrative has a larger audience than legitimate news. The corrected version has a lesser audience than original misinformation. Opeds were written literally from day 1 of a famous journalist’s murder in Bengaluru, the elite had already decided who was guilty before any investigation began. Deaths of children in Gorakhpur hospital is condemnable. But did readers get to read the full story? From US media, when a black cop shot a black with a gun, the reporting was completely different as it did not “fit the narrative” of a white cop killing a black. When a friend of yours shares it on Twitter and Facebook, you tend to trust that news more, even if it was a false narrative. Govts are known to give a different spin to news during war times. An author is taking his/her own view of an incident without any basis to give a false narrative. The main goal of the author is to harm a person, political party or even the country. Recently Indian Ambassador to the US slammed US media for negative portrayal of India without getting into the facts. Today, in the age of TV & social media there is constant discussion of the narrative, no matter how baseless is being stretched and twisted. This may look entertaining (nightly news!) but is very harmful. Media students are taught about “WHO, WHAT, WHEN, WHERE, WHY and HOW”, but rarely practiced. There is a race for ‘who published first’ in digital media. Corrections to the story, if at all, can come later. Young journalists are not making calls to cross-check the veracity of what they are writing. Most journalists in the online space depend on Twitter, TV, and print to write their articles. The same topic, especially if sensitive, are not covered the same way in each medium. By the time someone down the chain writes about it, you can expect the meaning to have changed. At best, online publishers these days check if an image was associated with some other event before using it in an article. This can be easily done on sites like tineye.com or Google Images. But this doesn’t fix the problem of identifying false narrative. Publishers, platforms don’t want to be policed. They want to regulate themselves. If this self-regulation fails, governments will be forced to bring in policies. The government of India tried to look into this problem, but the plans were announced in a hurry, which I believe will not see the light of the day. Social media has made the problem of spreading false narratives worse. Fixing a false narrative is complex. An algorithm, however complex, cannot identify this problem. For now, it has to be done manually by countering such news but this is not a scalable model. Someday if technologically this problem is solved, the problem in India is multi-fold – we publish news in multiple Indian languages. While there are efforts in the area of NLP (Natural Language Processing) focused on Indian languages, it would be interesting to see if they can come up with something to identify false narrative.